The problem is to study the intrinsic local and global convexity of the affine structure of the base space of integrable Hamiltonian systems whose singularities are nondegenerate and without any hyperbolic component, i.e. only elliptic and focus-focus components are allowed. In the case when all singularities are elliptic, then the problem has been solved long time ago (Atiyah-Guillemin-Sternberg, Delzant, etc.). From local convexity one can obtain global convexity in this case (under some properness conditions) via the “local->global convexity principle”. In my paper (proper groupoids …, Ann. ENS 2006) I also wrote a version of this principle and applied it to a more general context of proper groupoids, though of course it dates back to much earlier works by other people. We conjectured that the answer is Yes, in view of the classical “local->global convexity principe”. We thought that this principle could be extended to the case with focus-focus singularities without too much trouble. But our many attempts to rpove it, using all the methods that we knew (imitation of the proof in the case without monodromy, topological arguments, variational methods, etc.) failed, and we were really frustrated for quite some time. Finally, we realized that we couldn’t prove it because it is NOT TRUE! So we tried to construct a counter-example, and succeeded. Here it is: it’s a variation of the “classical” construction of “Hamiltonian K3”, i.e. an integral affine structure on S2 with 24 focus-focus points. – It has a “concave boundary”, whose characteristic numbers of the edges are written there. – Any straight line coming from the center of this figure will get trapped inside the polygone: it will turn around in the region between the boundary of the polygone and the boundary of the convex polygone formed by the focus-focus points. Here the characteristic number of n edge is explained in the following figure: (if the edges were the images of elliptic singularities then these numbers would be the self-intersection numbers of the spheres which are their preimages in the symplectic manifolds). Now, take “standard” affine an octagone. 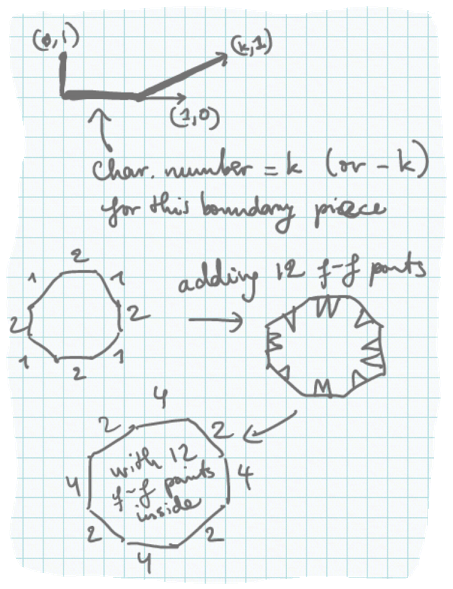 Its edges will have characteristic numbers 1,2,1,2, … . 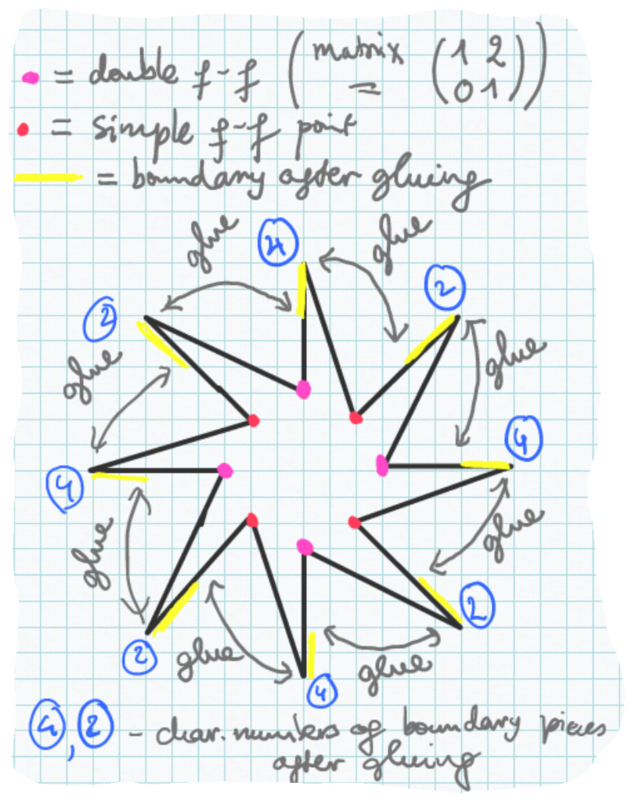 Modify it by adding a focus-focus point “to” each edge of char number 1, and 2 focus-focus points “to” each edge of char number 2 –> we get a octagone with 12 f-f inside, but now the char numbers are 2,4,2,4, … This convex octagone can be glued to the above octagone (whose boundary is the same, but inside-out), to obtain a S2 with an integral affine structure on it (with 24 f-f, as usual). The is no straight line which can connect the two centers of the two octagones. So this affine structure (which corresponds to a Lagrangian torus fibration with 24 f-f singularities over S2) is locally convex but globally NOT CONVEX! One may argue that the above example doesn’t admit a GLOBAL momentum map with only f-f and alliptic singularities. Indead, in the 2D case, if there is a global momentum map, then this force the base space to be a disk or an annulus and then we still have global convexity even in the presence of f-f point (the above countere-xample won’t work any more). However, starting from 3D, a global momentum map won’t save convexity. for example, one can take S2 X D1 and embed in into R3. Equip with with the above affine structure on S2, direct product with an affine structue on D1. Then the this is not globally convex, but admits a global momentum map.